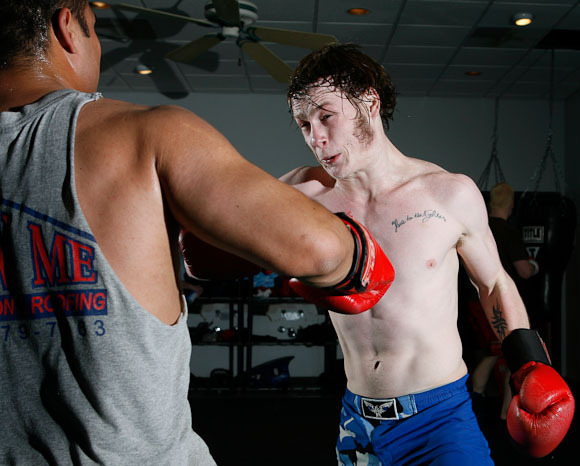 Recently I’ve been trying to make photographs of the fighters at the Hulett House, a mixed martial arts training gym run by Rob Hulett and part of the Midwest Fight League, while sparring with each other using at least two flash heads for cross lighting. One of the greatest challenges is to ensure that the light stand (I’m triggering wirelessly either with Canon ST-E2 transmitters of with eBay “poverty wizards”). In this case, I’ve lit the scene with two 550EX Speedlites aimed right at one another. I was using daylight white balance because I was letting the flash heads overpower the ambient light, but now I regret that decision and wish I had gone with a CTO gel and tungsten white balance to make the overhead lights appear white. C’est la vie. Also, the shadow cast by the strobe on the right is a bit distracting. But what made this, to my mind, the strongest of the images was Croom’s expression paired with the position of the bright red boxing glove in the lower right-hand corner. Without that glove as an anchor for the composition, this wouldn’t be a successful image at all. 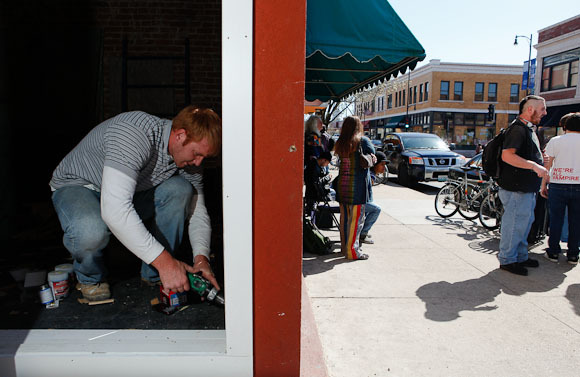 Ryan McCullen of Hubert Builders boards up the window frames of 22 9th Street in Columbia, Mo. The space, which was previously the headquarters of the local Obama for America campaign, is now being renovated for a planned women's boutique. “Fill flash.” It’s a term familiar to pretty much everyone. The only thing that makes it more interesting is when you decide to take the flash off of the camera and place it on a stand. 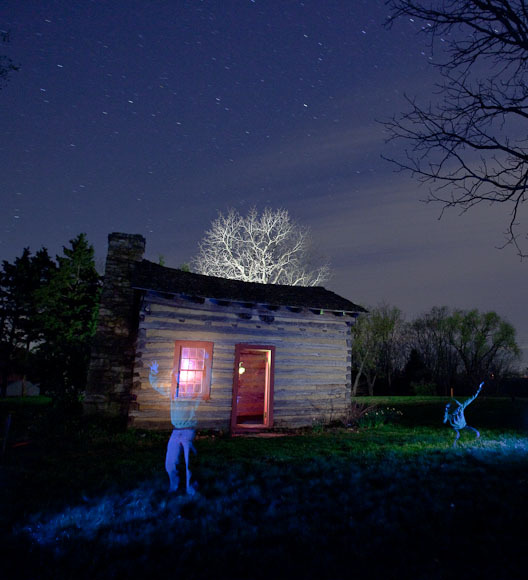 This frees up the photographer to place the light where it should be, not where the camera is positioned. For wildlife photographed with a 500mm lens, placing the flash on axis makes a lot of sense–on a cloudy day just dial down the flash to -2 or -3 EV (via ETTL), put a Better Beamer on there, and call it a day. For this assignment I was working with less space than I would have liked, and what began as a completely open storefront was actually being boarded up by the construction worker, Ryan McCullen. I really wanted a second light: one inside (behind him) to work in tandem with the flash that I had with me. Of course, before he boarded up the windows, I had two lights (the sun, hopefully operating at full power…). I triggered the flash on the light stand with some “Poverty Wizards”–the cheap radio remotes from Hong Kong that are all over eBay. I do own a Canon remote trigger, but it is based on infrared line-of-sight, and in bright sun it simply doesn’t work. If I could afford Pocket Wizards…some day. Until then, the cheap eBay remotes seem to be working! With a little help from the fill light slider in Lightroom, the image opens up pretty nicely, and the juxtaposition between McCullen working away and the motley crew of people hanging out on the street–“We’re All Vampires” does amuse me. For the past few days I’ve been peering over at the other side of the fence to see what Nikon has to offer with regard to off-camera lighting. 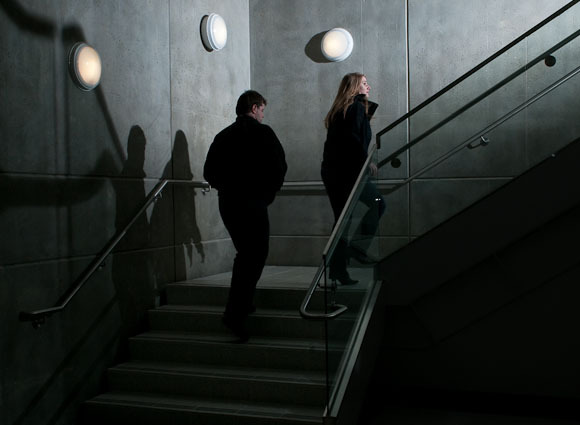 I had heard about CLS–the Creative Lighting System–for some time, but few here at Mizzou seem to be using it. Finally, I just decided to check it out for myself, so I borrowed a D300 and an SB900 Speedlight and discovered how ridiculously easy it is to control the flash unit from the camera in either fully-manual or ETTL modes. From the perspective of a Canon user, it’s just sick. Diane Dorter inspects a Meadow Lark with an injured foot on Sunday, March 15, 2009 at Wild Bird Rehabilitation in St. Louis, Mo. 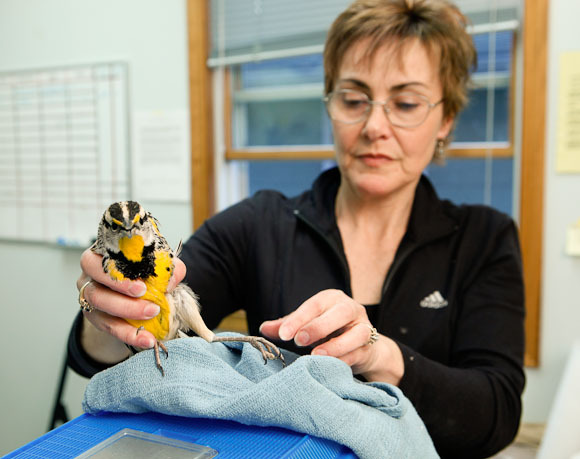 Dorter, one of three paid staff at the non-profit organization, was training Lizzie Vreeland, a volunteer from Washington University, how to care for birds at WBRs emergency room. Many of the birds require medication and are tubed via syringes, a procedure that requires great care. While in Saint Louis last weekend, I dropped in on the site of my final project from Fundamentals of Photojournalism (from last semester), Wild Bird Rehabilitation. 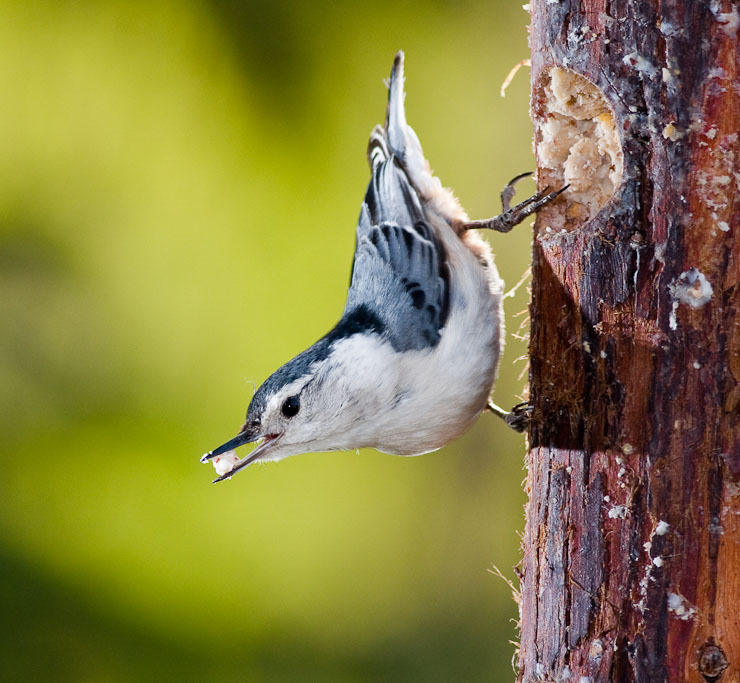 Unlike most of the (few) bird rehabilitation centers in Missouri, WBR focuses on songbirds. The birds that they work with are brought to WBR by concerned citizens, often people who have birds crash into the windows of their houses, or mauled by their pets in their yard, who want to do all that they can for our avian friends. This time of year, March through June, lots of migratory birds come through the area along the Mississippi Flyway. When I came in last week, Diane Dorter, one of three paid staff at WBR, was teaching volunteer Lizzie Vreeland how to care for birds at WBR’s “emergency room.” Vreeland has been a volunteer at WBR for close to one year, but recently became interested in working with the most critical avian patients at the facility.